Sometimes a match can completely change your opinion. Before Genoa-Parma all fans of Genoa were only happy with a victory, now after the match we are all very happy with the 2-2 draw. Till the 78th minute Parma leaded by 0-2 in Luigi Ferraris by goals of Gobbi and Floccari. In the 78th minute Rodrigo Palacio scored a penalty in two times and gave new hope to the Genoa-fans. In the 96th minute the important second goal arrived: substitute Jorquera gave a perfect assist to Rodrigo Palacio who scored already his 14th goal this season. The fourth defeat in a row did not arrive and Pasquale Marino saved his job for at least another week. Sunday we play in Lecce against the hometeam that now only has 7 points less than us after their victory in Cagliari. A defeat is forbidden! Also Chievo too strong; let’s beat Parma! 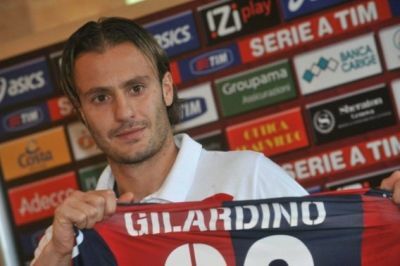 We can surely say: Genoa misses Alberto Gilardino. The central-forward is essential in our 4-3-3 system. Before Gila arrived we had problems to score and since his injury after the match against Lazio we did not score any goal. Against Chievo the team of Pasquale Marino had 3 big chances, but Kucka, Jankovic and Palacio missed them all. In the 30th minute Théréau of Chievo did score the only goal when Marco Rossi only watched the ball and forgot his French opponent. The 0-1 defeat was a shock to the fans, coach Marino and also president Preziosi who celebrated his birthday. Tomorrow Genoa plays again at home in Marassi and the 3 points are nescessary to avoid a crisis and to keep the distance with number 18 in the standings Lecce. We now have an advantage of 9 points and have to beat Parma to travel with confidence to Lecce next week, in which match probably Gilardino will return in the team. Last Wednesday Genoa lost by 1-0 in Bergamo against Atalanta. It probably was the worst match of Genoa since the return in Serie A in the summer of 2007. The team played without any confidence after the big defeats outside Ferraris the last matches. Halfway the 2nd half Juraj Kucka headed the ball on the crossbar and a few minutes later Atalanta striker Denis did the same at the other side above Sebastien Frey. With both teams hitting the crossbar once it seemed a typical 0-0 match, till Marilungo scored the only goal 12 minutes before the end. Genoa stays 10th in the standings with 30 points. Tomorrow Chievo arrives in Marassi, so we hope again to see a completely different Genoa. Our coach Pasquale Marino misses the injured Alberto Gilardino and the defenders: Antonelli, Bovo, Mesto and Moretti. Again a big defeat of Genoa in an away match after a great game in Luigi Ferraris. Coach Pasquale Marino don’t understand the big difference between Genoa at home and outside mama Ferraris. In our own stadium we create many chances and have an average of 3 goals the last matches, in awaymatches the opponent has an average of 4 goals the last weeks. In Catania midfielder Valter Birsa already in the 7th minute made a stupid and unnecessary foul in our penaltyarea which gave the hometeam a penalty: 1-0. In the second half Barrientos of Catania scored twice in the first 7 minutes: 3-0. Ten minutes later the final score of 4-0 was already on the scorebord. Besides the 4-0 defeat we also lost Kaladze and Mesto with a yellow card, so they can’t play in Bergamo Wednesday. 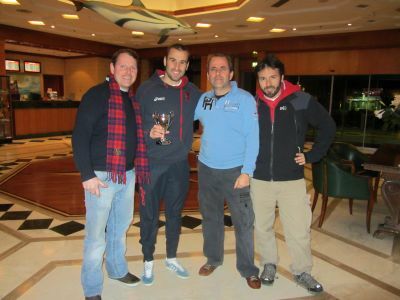 Saturdayevening we honoured just like last year Rodrigo Palacio as Genoa Club Amsterdam Genoano of the year. In the Sheraton hotel near the airport of Genova we met Rodrigo who was with the team in the hotel to prepare for the match against Lazio the next day. Rodrigo is again chosen as our man of the year, not only because of his fantastic way of playing, or his many important goals but also because he stayed with Genoa and refused the transfer to Inter which wanted to pay him a few times his salary with Genoa and gave him the opportunity to play in Champions League. For this reason we surprised Rodrigo with a little copy of the most important European trophy, to show him that also with Genoa you can win the Clampions league. Rodrigo was very pleased with the trophy and thanked all the members of Genoa Club Amsterdam. After Udinese and Napoli this time Lazio was send home with a 3-2 defeat in Marassi. Again a very spectacular match with 5 goals and a few minutes of sufference at the end. 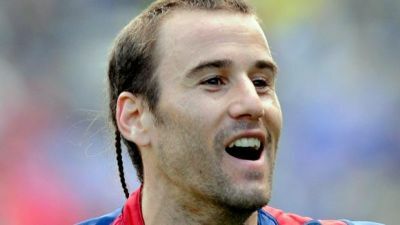 The just honoured Genoa Club Amsterdam Genoano of the year: Rodrigo Palacio scored the first goal with his heel inmediately out of the corner of Jankovic. A wonderful goal just as last week against Napoli of our topscorer who celebrated his 30th birthday. Halfway the first half Jankovic doubled the score after a cross of Beppe Sculli who played against his former team before the transferperiod in January. With 2-0 halftime arrived. After only 12 seconds in the 2nd half Jankovic scored his second and Genoa’s third goal when his defender Garrido slide down on the half frozen field. Game over with 3-0, not with Genoa! Within 10 minutes Ledesma scored 3-1 out of a penalty (mistake Mesto) and because Genoa refused several times to score the fourth goal the match was again completely open when Gonzalez scored 3-2 in the 89th minute. Happily Lazio already played with 10 men at that moment because of the red card of Diakité, so they could not really give a lot of pressure at the end. Again 3 points to the team of Pasquale Marino.